Our flexible payroll services improve productivity, simplify administration and improve payroll management for employers. We handle all of your payroll and tax preparation, so that you can focus on growing your business. Customer satisfaction is our first priority. Maintaining courtesy, dedicated, and personalized service is essential. We provide a quality product with enthusiasm. Without our clients, we would not exist. We help businesses save time and money with payroll. We understand the burden payroll places on small businesses so our goal is to make life easier for you and your company. We have a comprehensive list of payroll products and management services to help you keep track of your business. Service is the key to our success. You and your business are important to us and we look forward to providing you with the absolute highest level of service, as we strive to take the worries and troubles of payroll off your hands…so you can get back to business. Providing our clients with perfect payrolls and managing their payroll tax liabilities with a passion is our business. We timely and accurately process hundreds of thousands of tax dollars every year for businesses like yours. Our products are designed and packaged to help you manage your payroll simply, while keeping your costs to a minimum. Whether you want Internet processing, Total Tax Management , Direct Deposit, Benefit Time-off Accruals, Integrated HR, one of our many other products, or one of our comprehensive packages; we have something to fit businesses and budgets of all sizes. So whether you're looking for a better way to administer your payroll...manage restaurant payroll and tip reporting...distribute paychecks...pay your taxes...or report new hires...Seda Accounting has the solution for you! 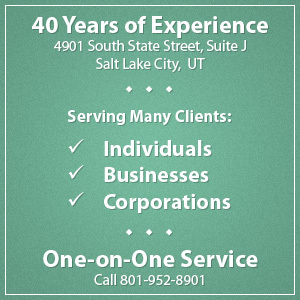 Call 801-952-8901 today to start working with an accounting firm that can really help you with your payroll services. Call us to schedule a free consultation to find out how we can put our knowledge and experience to work for you.